Queen Mary on 20 June 1945, New York. Construction of “Hull Number 534”, as it was called when commenced, started in 1930. John Brown & Company in Clydebank, Scotland, built it for Anglo-American cruise line Cunard. This ship aimed to compete with German superliners “Bremen” and “Europa”, that were already in service at this time, and to get ahead the construction of “Oceanic” by White Star Line that started two years before “Hull Number 534”. King George V chose the name Queen Mary for the ship in honor of his wife. Her first maiden voyage happened on May 27, 1936 when she reached the speed of 33 kn (61 km/h; 38 mph). It was a large 81,237-ton liner, 1,019.4 ft (310.7 m) in length and 118 ft (36.0 m) in width. Wider than Panama Channel, she had to go around South America and Cape Horn when sailed on her last trip from Southampton to the port of Long Beach, California. During the war time, the ship was converted into a military transport, repainted into navy gray and got the name “Grey Ghost.” The speed of the ship allowed escaping enemy submarines with ease. More, Grey Ghost always moved in a zigzag pattern, to avoid possible unnoticed torpedo attacks. 40-millimeter anti-aircraft guns on the deck were deflecting possible air strikes . A strict order to keep moving and not to stop under any circumstances, even for salvation those who in distress. 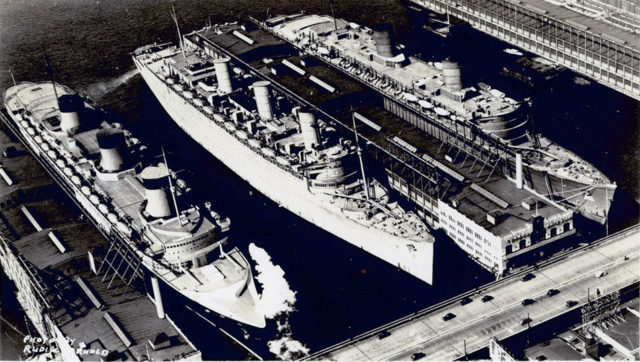 The capacity of Queen Mary was 2,139 passengers, but after adjusting for military needs, it grew to 5,500. During one trip across Atlantic, the ship crossed the ocean with record 16,683 troops aboard. 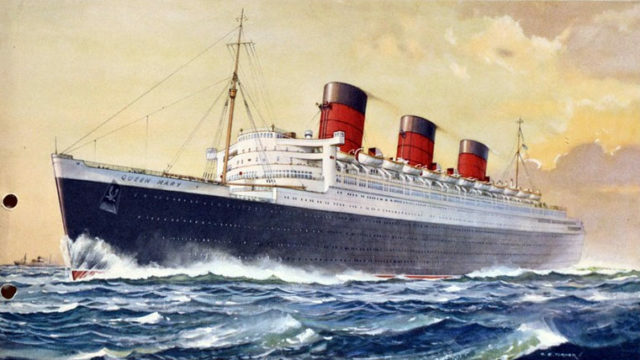 After the end of the war, the liner continued to serve transatlantic line. 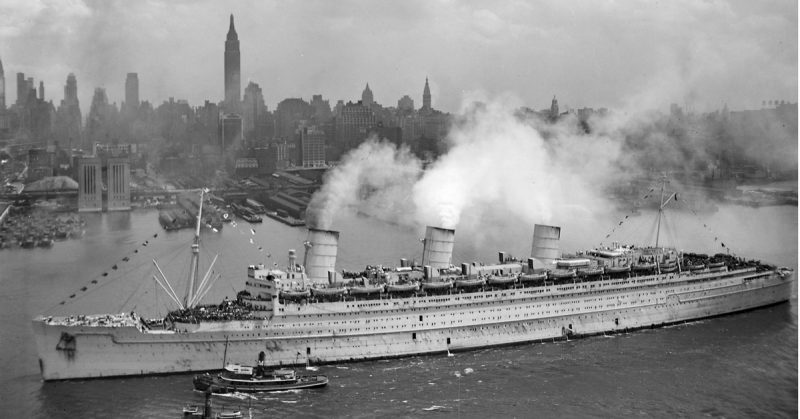 However, it was getting harder and harder to compete with airlines, so Queen Mary had to be decommissioned. 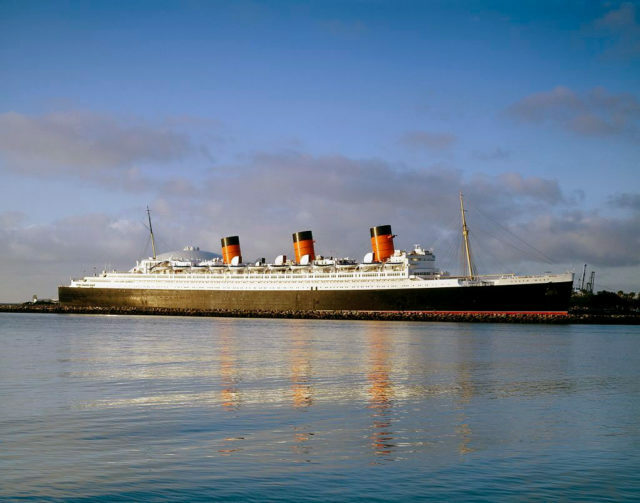 It was sold to the city of Long Beach, USA, and on 31 October 1967 Queen Mary ferried the last 1,040 passengers to its final destination in California. Today the ship serves as a tourist attraction featuring restaurants, a museum, and a hotel. The three biggest ships in the world: Normandie, Queen Mary and Queen Elizabeth, 1940. 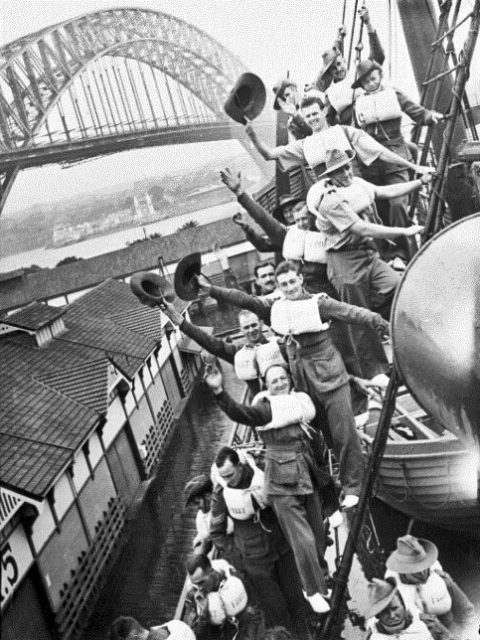 Australian Army soldiers, possibly on board RMS QUEEN MARY, 1940. 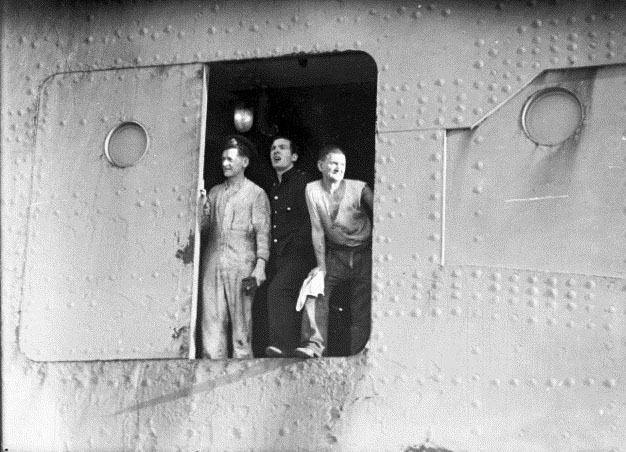 Three unidentified men possibly on board RMS QUEEN MARY near Port Jackson in Sydney, May 1940. Queen Mary ship, Long Beach, California. 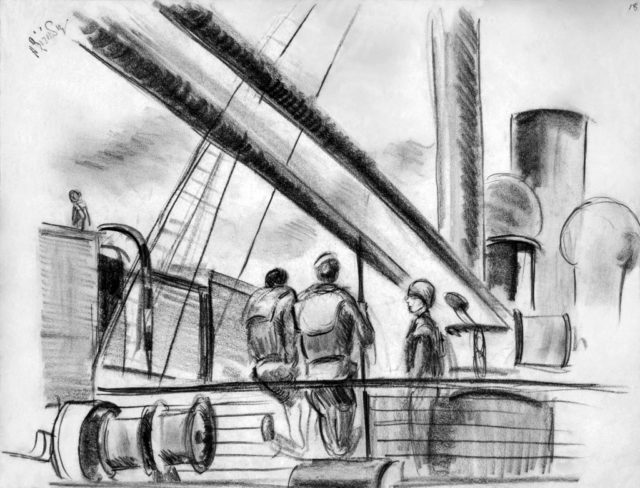 Artwork: “Queen Mary Crossing #18”, Atlantic Ocean 1942. Artist: H. Robert Bizinsky. US Army Art Collection. 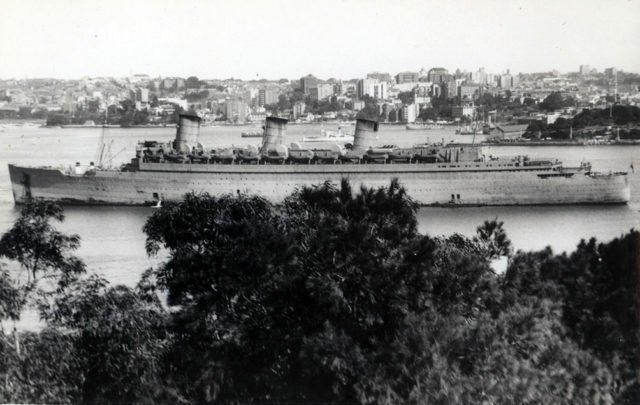 Troopship Queen Mary in Sydney, World War II, 1942.